The January 2019 Edition of the Grain Waves E-Newsletter marks the first of our new monthly design. 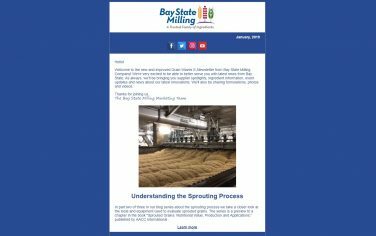 This month, we shared new information about the sprouting process and highlighted the versatile flax plant. The new year also provided an opportunity to celebrate. We put on the party hats for National Gluten Free Day as well as the Bay State Milling Value Awards.